Emotional intelligence is crucial for business leadership, and nowhere is that more true than in Asia, where emotions are particularly likely to be concealed during daily business interactions. Emotions can be a major asset for leaders if properly understood, and a source of significant disruption if they are ignored. 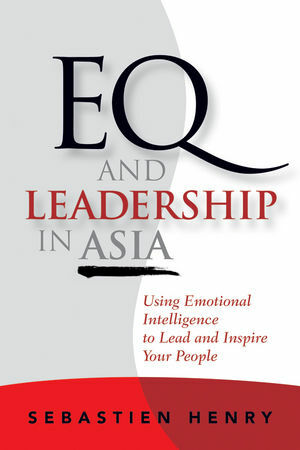 EQ and Leadership in Asia provides business leaders in Asia with the keys to using emotions as allies as they face practical business challenges. Presenting emotional intelligence in a clear, straightforward manner that anyone can understand, the book shows what it can accomplish, why it matters, and how to systematically improve your ability to understand emotions. Looking at the real challenges that leaders in Asia have to face every day and exploring how emotional intelligence can be used in each instance, this compelling book is essential reading for leaders who want to inspire and influence their coworkers and lead their companies to greater success. A guide to emotional intelligence designed for people working in leadership positions in Asia, EQ and Leadership In Asia is the only book you need to harness emotion in order to create a better workplace. Sebastien Henry is the co-founder of Progress-U, a high-end coaching and training company with operations in Mainland China, Hong Kong, Japan and Singapore. He was a regional manager for Asia at a multinational company before becoming an entrepreneur and professional executive coach in 2005. He has been training professional coaches in Hong Kong and Shanghai since 2007, and has developed the "INSPIRE!" program, a leadership retreat for senior leaders conducted regularly in South China. He works with senior leaders to enhance their success by becoming more inspiring to their people and organizations. His articles on emotionally intelligence in leadership has been published in Human Resources and the South China Morning Post. He speaks six languages, including Japanese and Mandarin. PART ONE UNDERSTANDING EMOTIONAL INTELLIGENCE IN ASIA. 1. Does It Make Sense to Write About EI in Asia? 2. EI and Why It Matters in Asia. 3. The Various Facets of EI: Four Areas to Develop. 4. EI Is Not about Being Nice and Sweet. 5. Asia’s Contribution to EI: The Power of Paradox. 6. Using Both Masculine and Feminine Energies. 7. Four Steps to Develop Your Emotional Intelligence. PART TWO USING EMOTIONS AS ALLIES IN PRACTICAL LEADERSHIP CHALLENGES. 8. Choosing to Use Emotions as Allies. 9. Preventing Damaging Emotional Outbursts. 10. Using Emotions to Create High Engagement. 11. EI for Getting Things Done and Making Tough Decisions. 12. Emotions as Keys for a Way out of Conflict. 13. Emotions to Lead Your Team to the High-Performance Zone. 14. Emotions and Intuition for Effective Decision Making.